Handmade roses, dragon balls, instructions:(500 grams a pound of mail, one about 9-10 grams, a catty of about 55 to 60 grain is weighing as the standard. And because it is handmade, the beads to do uniform, plus the curd of different density, weight will be different. Some catties will have more than 50 grains, and some will have more than 60 grains are possible. Make sure enough! RoseAfter the ball bubble open is full of flowers, one can make a big pot, can put the curd Baicheng 2-3 split one time bubble drink drunk. 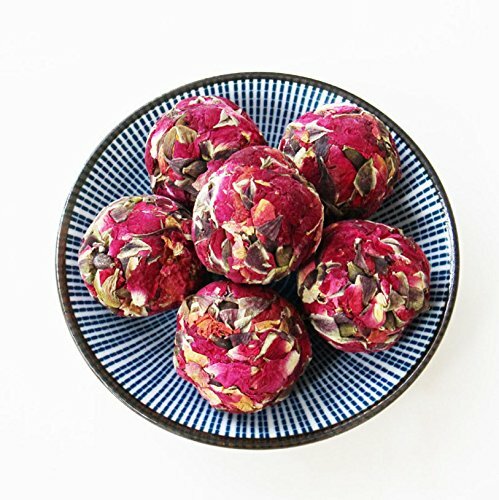 We only choose high-quality non sulfur smoked raw material rose crown,Handmade pearl tea production, each master daily production limited.All the flowers bloom,Not broken, it is miscellaneous, smooth appearance, uniform granules mellow. Independent packing to avoid light head outside, preservation effect, are the most fresh raw materials, the shelf life of two years. After the ball bubble open is full of flowers, one can make a big pot, can put the curd Baicheng 2-3 split one time bubble drink drunk. The environment is wide, the environment is clean and healthy, and the relatives can buy it at ease. How good are we after the sale All the old customers will know!